fantastic little set of 4 box drawers in soft antique aqua-duckegg with rustic cream fronts. 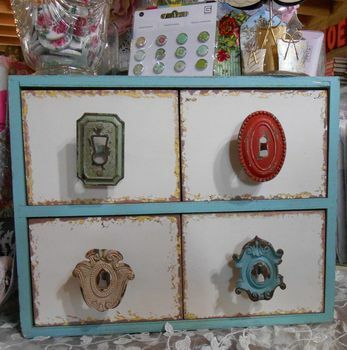 fab old door handles set drawers off and ideal for all those fat quarters. how good does this look in your studio or sewing room! 12"(30cm)wide, 9.5"(24cm) high, 8"(20cm) deep.